ATC has 4 ‘all weather’ floodlit courts and a clubhouse with excellent viewing of the top courts. It has kitchen and toilet facilities as well as free onsite parking. Heating is provided for your comfort; the switch is (clearly marked) by the entrance to the kitchen. The heaters are on a timer - just press to restart. If they are still on when you leave, simply secure the clubhouse as normal - they will go off at the end of the timed period. If you are last to leave PLEASE make sure the clubhouse is secured. Will May-Miller is the Club’s professional coach. He offers a range of coaching opportunities for Adult and Junior players. Adult coaching includes courses designed specifically for Beginners, Intermediate and Advanced players, ‘confidence building’ courses for anyone wanting a boost or refresher before joining mix-ins or squads, and cardio tennis. Junior coaching includes after-school term-time classes for a variety of age groups, Easter and Summer camps and LTA tournaments. For details of the coaching programme can be found on the coaching pages of our website. Please note that children under the age of 14 years should not be left unsupervised at the club at any time and that children attending club sessions, coaching or tournaments remain the responsibility of parents during sessions. The club runs one main competition in the period from May to September, and “American” tournaments throughout the year. The main tournament is played on a round-robin format with entrants organising their matches by a specified “play by” date and all the finals being contested on a finals day. The half day “American” tournaments are played on a round robin basis with partners allocated on the day. The club holds annual knockout competitions for Under 14s and Under 18 junior players and the coach organises competitions and team matches for juniors who are on their coaching programme. Visitors are welcome to come & play with members on up to 3 occasions in each year - a visitor fee of £2 for Adults & £1 for Juniors is payable. Please enter the details of each visitor along with your name in the Visitor’s Book in the clubhouse & place the money in the locked box in the kitchen. We encourage regular visitors to become members. We like to arrange social events at and away from the Club. Details of all the events will be put on the ATC website and social notice board in the clubhouse. 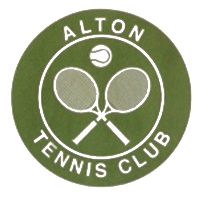 Alton Tennis Club enters Men’s, Ladies’ and Mixed teams in the summer and Men’s & Ladies’ teams in the winter in both the Aldershot and East Hants Leagues. If you are interested in playing in a team and would like more information about team play, please contact a committee member or email the club. All four courts have floodlights and the cost of using the lights is included in your subscription. Please make every effort to ensure that lights are only on when the court is in use and are turned off immediately play is ended. The security of our facilities is every member’s responsibility. The codes for the locks must never be revealed to non-members and are changed annually (at least) to ensure that only members have access. All the court padlocks should be secured on the inside of the court except those of the main access gates. After opening the main entrance gate please take the padlock into the clubhouse and place it on the floodlight control box. This ensures everyone knows where it is and it does not get lost. Most importantly of all, on leaving, please check that all lights are off and all doors and padlocks are properly secured. If others are still playing, and it is not possible for you to secure the club, check with them that they are happy to do the security checks and lock up. We take seriously the safety and well-being of our members. The club is LTA affiliated and as such we are required to adhere to LTA policies and procedures. Should there be a major accident, or a member is taken seriously ill at the club, please ring 999. For heart-related events, a defibrillator is located in the neighbouring Cardio Rehab Centre; please contact them where circumstances dictate. All accidents at the club must be reported in the ‘Accidents’ file located in the main cupboard (marked 'First Aid') in the clubhouse and the Club’s Welfare Officer, Judy Brown must also be informed as soon as possible (contact details below). This is a requirement of our insurance policy through the LTA. In addition, we adhere to the LTA’s Safeguarding and Equality Policy and the accompanying Code of Conduct. All members are required to indicate to the Club Welfare Officer that they have read, understood and follow the Policy, Code of Conduct and Reporting Procedure. Our policies are on the 'Rules and Policies' page of this website and on display in the clubhouse; please familiarise yourself with them, then confirm to Judy Brown that you have done so. As a member of ATC you can join the LTA for free becoming a British Tennis Member (BTM). This in turn entitles you to “opt in” to the Wimbledon ticket ballot which if successful enables you to buy Wimbledon tickets. Please do register for your BTM number as the club is allocated Wimbledon tickets according to the number of Alton Tennis Club BTMs registered. On production of an email confirming current membership, members of ATC are entitled to a 10% discount on non sale / deal items. If you would like to help in any way with the day to day running of the club (helping with maintenance of the grounds or the clubhouse, admin tasks, newsletters, updating of the website etc.) please contact any of the committee members (see ‘ATC Committee’ page on the website). We welcome any feedback you may have about the club – please don’t keep your good ideas to yourself! Members are welcome to attend committee meetings and the Annual General Meeting is usually in November each year - we would be delighted to see you there.